Substantial 6 apartment semi-detached family house within sought after residential area. The property offers generous apartments comprising entrance porch, hallway, half bay fronted good size lounge, two adaptable apartments currently used as dining room and a gym both of which could offer double bedroom accommodation if desired, ground floor shower room with double shower & modern kitchen with wall & base units. 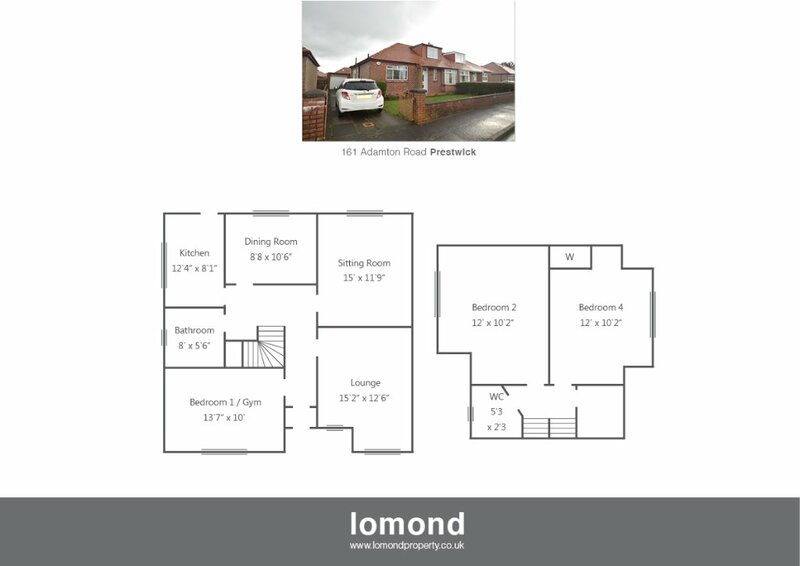 On the upper level there are 2 spacious double bedrooms, walk-in wardrobe & cloakroom w c.
Warmed by gas central heating the property also benefits from being double glazed and offers off street parking for several vehicles leading to brick garage. The garden grounds are well maintained with walled front garden & fully enclosed child & pet friendly rear garden with paved patios, lawn, flower beds & borders & a variety of shrubs & young trees. Located close to popular local schools & local amenities the property offers an ideal family home. From our office on Prestwick Main Street proceed south on Main Street turning left onto Bellevue Road. Proceed to traffic lights turning right onto Adamton Road where the property is on your left.